Leading Irish Republican, Martin McGuinness has been dead for a year. He passed away in Derry’s Altnagelvin Hospital on 21 March 2017, from amyloidosis, a rare genetic condition. His death evoked a myriad of memories and emotions. The spectrum of reaction showed that many people of a certain age momentarily reconnected to the “Troubles,” in a very vivid way. This highlights why dealing with the past remains so potent a political issue. The question of legacy even remained unresolved in the draft agreement between Sinn Fein and the DUP that almost got across the line a few weeks ago. Martin Mc Guinness was celebrated and demonised in almost equal measure. Aside from the Republican community, Presbyterian minister, Rev. David Latimer lamented the loss of a close friend. Ian Paisley Junior, obviously influenced by his father’s miraculous reconciliation with the Republican leader, was calm and considered. Former British government minister, Norman Tebbit, represented the other, deeply angry, end of the spectrum. The former Deputy First Minister was shaped by “war and peace”. Calling time on the DUP – Sinn Fein Executive in January 2017 was his final political act. His human vulnerability was also vividly displayed at the time, ironically adding power to the political move. There was a grim prescience in the forlorn and frail face behind the rain-soaked car window, as he left Stormont for the last time. The image has won the photographer prizes and is set to become part of our historical iconography. A major biography of Mc Guinness: Martin Mc Guinness: The man I knew, by Jude Collins, is also due out this week. I am very much processing the past myself at the moment. So, for the historical (and journalistic) record, I now proffer my experience of the former Deputy First Minister. I was a journalist in Brussels in the mid-1990s when I, and a few others, including the Guardian’s then European Editor, John Palmer, received a surreal summons one mid-week afternoon. An Irish embassy source told us to come to a hotel on the out-of-the way end of Rue Royale in the Belgian capital. The hotel’s old-fashioned grandeur created an ambience more akin to wartime Belgium. We were directed to a room at the back of the hotel for an impromptu and unorthodox briefing. An Irish government official accompanied by Martin Mc Guinness entered the room. Technocratic tales about structural funds, directives and regulations were standard fare for the Brussels’ press corps in those days. What was Mc Guinness doing here? The 1998 Good Friday Agreement was still in the future. Yet the Irish government was facilitating the Republican representative. It was surreptitious stuff just like a John Le Carre novel. Mc Guinness was presumably lobbying the European institutions in the wake of the IRA’s two ceasefires? Decommissioning had become a unionist condition for negotiations, as for many in the British establishment were concerned. Republicans perceived decommissioning as tantamount to surrender. An intense conversation ensued between the half dozen or so British and Irish journalists and a confident, completely self-contained Mc Guinness. This was the first and last time I met the man. He painted a picture of the painstaking conversation within republicanism. I was in my mid-20s and the Troubles were raging when I went to the European Parliament in Luxembourg in 1985 on a scholarship scheme. I then got a job in Brussels, working for a policy publication, run by an Italian, who did the exceptionally rare thing of leaving the European Commission. I went freelance after a three-year stint. The continent afforded escape from the bleakness of Belfast. Here I was, face-to-face with an alleged one-time IRA Chief of Staff, at least ten years into my comfort zone exile. I posed a convoluted question about decommissioning. Mr Mc Guinness, Martin, I cannot remember how I addressed him. “Why not hand your Semtex over to the Irish Army and let them blow it up in front of the international media,” I asked. “This would be a great publicity move,” I cautiously teased, implying that this would be a “spectacular” in IRA-speak. His piercing eyes tilted down at me as he studied for a moment before vividly describing the meticulous choreography that the path to peace entailed. Subtlety rather than spectacular was what was needed, he rather wryly counter implied. As I finally produce copy from that meeting all these years later, the ironic image of defusing something comes to mind. And I now fully grasp, if I didn’t then, that conflict is a lot easier to start than to stop. With equal precision and discipline the Derry republican wound up the clandestine briefing and was gone. On the day that Martin Mc Guinness’ died, I fully relived this encounter. A few years, either before or after that event, a British source in Brussels provided me with a chilling insight into the deadly drama played out on the streets of Derry, when and where Mc Guinness held sway. That cloak and dagger Brussels briefing all those years ago was also prescient because of the European Union dimension. Brexit is bringing the last century of British and Irish history into sharp focus as the centenary of partition and the creation of the Northern Ireland state draws near. Martin Mc Guinness was a potent player in the conflict. But whatever any of us think of him and what he did – and we all own our own perceptions and memories, he played a greater part in concluding the conflict than he did in starting it. Each one of us, whether we identify as British, Irish or neither has a responsibility on how we manage our perceptions of people like Mc Guinness and, more generally, “the other”, difficult as that might be. I have no idea what precisely moved and motivated Martin Mc Guinness to so meticulously help break the cycle of violence. Whatever it was, it is likely that his role going forward from when I met him in Brussels will be the more prominent part of his legacy. As stated, pain and anger are still plainly palatable and that needs to be acknowledged and dealt with by politicians and other contemporary players. This certainly requires more sensitivity and subtlety. Spectaculars, even of the political or rhetorical kind no, I don’t think so. Calls for border polls, ostentatious commemorations and rigid adherence to dogma like abstention do not help. If “tremendous progress,” to paraphrase Mc Guinness, is to be made, everyone with any responsibility, from both our two main traditions, will have to try to emulate the Bogside man’s incredible capacity for meticulous choreography and outreach. Martin Mc Guinness evolved into a consummate and effective politician. 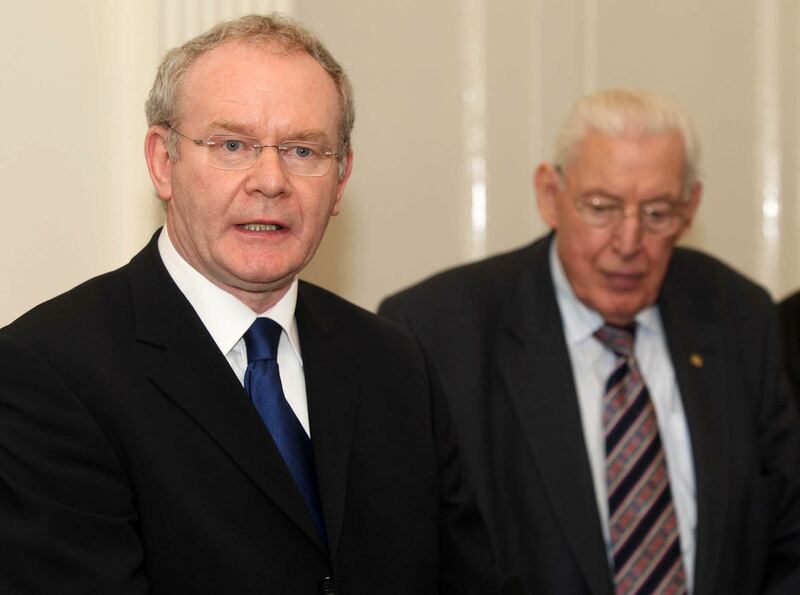 His remarkable relationship with Ian Paisley was gold standard reconciliation. Shaking hands with Queen Elizabeth II, reached out to unionism in a very vivid way, that they have largely failed to acknowledge. It was a monumental concession for an Irish Republican to make. The Queen reciprocated appropriately. They seemed to have had a warm and natural rapport? Martin Mc Guinness’ funeral was a popular spectacle and a showcase of the great and good. Former United States President, Bill Clinton, delivered an eloquent eulogy. Arlene Foster’s attendance was poignant, as was Michele O Neill awkwardly stretching back over peopled pews to shake hands. The applause Foster received in Derry’s Long Tower Church, despite the political stalemate not long under way then, showed that the space and opportunity for a deal was in the “Londonderry” air that day. The recent Sinn Fein – DUP draft deal, so meticulously documented by Eammon Mallie and Brian Rowan on this website, could well prove to be the high water-mark of that “space and opportunity.” Brussels, where I met Mc Guinness, is where the centre of gravity between London and Dublin will be played out in the coming months. Belfast has been eclipsed and has missed a trick, as history will probably prove. The graveside contrasted starkly with the church. Gerry Adams TD, the long, looming giant of Irish Republicanism, spearheaded ritual at the grave. On either side of him were the leading ladies of Republicanism: Michele O Neill and Mary Lou Mc Donald. Mc Donald, who seemed less comfortable with the ritual, nonetheless, through her demeanour, cut the presidential figure that she has been groomed to become. Like Mc Guinness she is a consummate politician, without which republicanism would be in trouble. She shifts the Sinn Fein focus to the South. She has her work cut out in a party with huge baggage. She is something of an enigma, has gravitas and guile. Will it be enough? If so, she could be destined for a truly epic future. The next five years are going to be crucial and testing for both parts of Ireland, Britain and Europe. If sport provides a fitting political metaphor, rugby provided Ulster and Ireland with a glimmer of hope on a cold St Patrick’s Day in Twickenham. If he had still been alive Martin Mc Guinness, apparently a keen cricket fan would have been at the match and worked it like a meeting-room in a now demolished, atmospheric, old Brussels hotel. March 21, 2018 in News & Current Affairs.